So one day "Artist" Yaya Chou decided the best way to bring awareness to bad stuff kids eat was by desecrating delicious red candy. The above sculpture is titled "Joy-Coated" and brings me negative joy. No one believes gummi bears are raised on free range farms and hand fed by virgins. Children eat junk. They watch junk. 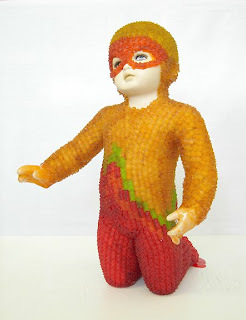 This sculture converts delicious red candy into junk. Also - Gummi Bears never have coupons. I hope she wasted generic bears to make her obvious point!